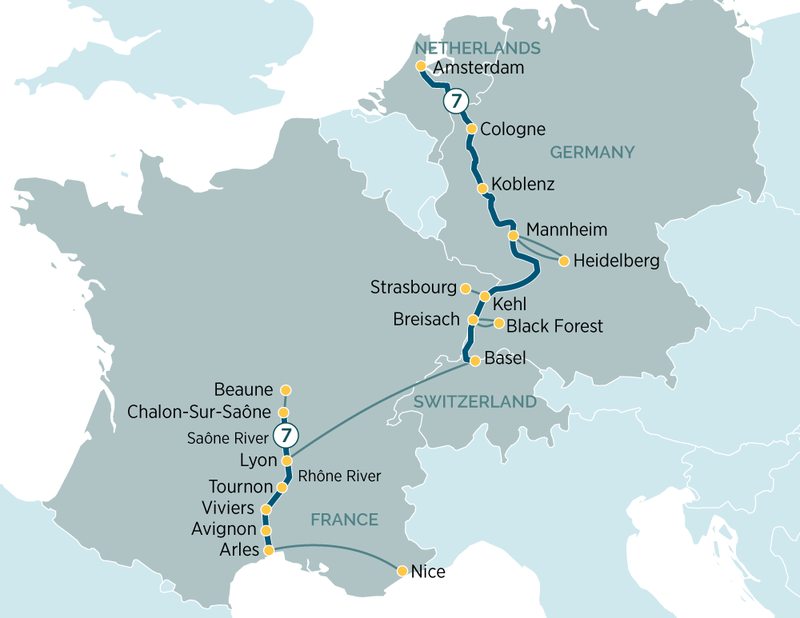 From Amsterdam to Nice, discover the highlights of four countries over the course of 15 days, which transports you from the Netherlands to Germany and Switzerland before ending in France. Elegantly cruise along the Rhine, Saône and Rhône rivers and take in the picturesque scenery as you cruise on by from your stunning Emerald Waterways Star Ship. Highlights include a visit to some of Germany's oldest cities such as ologne and Koblenz, sailing through the majestic Rhine Gorge and enjoying shore excursions such as a Black Forest cake tasting session and a guided tour through picturesque Strasbourg. Your journey continues from Lyon where you can soak up the rich heritage and the gastronomic old town including the secret laneways before an evening sailing. French highlights include a stop at Chalon-Sur Saone, Macon, Tournon and Avignon, a fortified town and regarded for its cuisine. End your journey in Nice. Welcome to Switzerland and the Rhine–side town of Basel, the centre for Switzerland's pharmaceutical industry. After, your breakfast you will disembark your ship and transfer by coach to Lyon. In Lyon, you will begin your new journey. After breakfast disembark your river cruise ship in Arles, transfer to Nice airport for your onward or homebound flight.